We are now introducing a new permanent straightening service here at Hair Transformer. The Ionic permanent straightening system is formulated with a Natural Ion Complex so it straightens all hair types without causing any further damage as normal day-to-day use of straighteners would cause. This formula and system restores and revitalizes the hair with immediate results leaving it feeling smooth and silky with incredible shine. The benefits of this process is that it contains a non damaging formula that is safe to use on most chemically treated hair as well as natural hair. No burning or itchy sensations and it revives damaged or lifeless hair. The pricing of this service depends on the length and amount of hair you have with the price ranging from $350-$500, this includes the cut and blow wave. To receive a quote on this service, contact the salon and arrange a consultation. 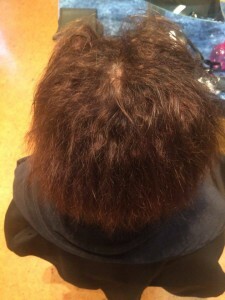 “The Ionic Straightening is the best straightening product I have used. I have used many different straightening products and wasted lots of money on this. The products didn’t last long and it was not fully straight at all. With the Ionic Straightening it is worth its money and makes your hair straight as. I have not had to use irons on my hair and its still straight as. I had this done about 3-4 months ago and its still straight. I’m really impressed with the product and would highly recommend” -Rachel. 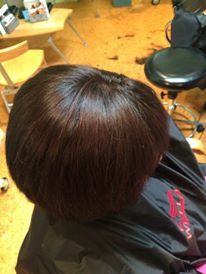 “I am a low maintenance person who had high maintenance hair- thick, wavy and very prone to frizz. Since I’ve had the Ionic straightening it is silky smooth and so easy! I can leave it loose or just pull it back in a pony tail, and it stays tidy all day. I cannot say enough good things about this procedure, it has literally given me the hair I’ve always wanted” -Adrienne. Before and after using the ionic straightening system.